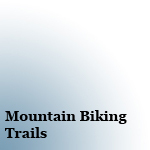 Biking trails reviewed are found in the Rocky Mountains and the Foothills. All these trails are for hiking as well and they will not be duplicated in the hiking section. Biking ratings are based on the overall view, condition and enjoyment of the trail. The rating will consider some of the difficulty factors as technical downhill can be fun. Elevation and distance are rough estimates based on maps and other data.